How to start a Surveilstar employee monitoring software trial? Starting a Surveilstar trial to realize a complete computer monitoring requires correct deployment of the software. Please follow the directions below to begin. 1. Disable all anti-virus software, firewalls, security protecting software (or something like that). Because those may affect the installation of Surveilstar. But Surveilstar will not do harm to your computers, so just rest your heart while installing. Well, this is just an option, not a must choice. 2. Make sure that your computer(monitoring computer) and your staffs’/kids’ computers do meet the Surveilstar system requirements. More details about this can be found here- http://surveilstar.com/download.html. 3. 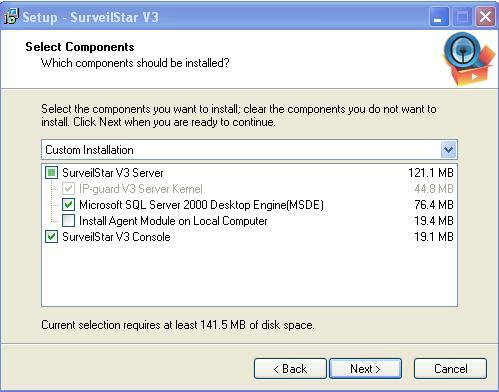 If you are using Win 7 64bit, you may need Surveilstar latest version which may have fixed some bugs of the last versions and better support Win 7 64 bit computers. If you want the lastest Surveilstar, please download it here. Or if you have installed Surveilstar older versions on your computers, you may just try the latest upgrade package for uploading yours to the new version. 4. Make sure that all the computers are in the same LAN. If not, send email to support@surveilstar.com for a latest document on how to deploy Surveilstar across networks. 1. For you own computer, here is what you need do. Install server and console. You computer is used to monitor your staffs' computers and collect monitoring data. Please remember that you only need to open the computer with the server when you are out. So, if you do not want to open your personal computer, you have to install the server in a separate computer. While installing, do not choose "install agent..." option. 2. Find the services in your task bar. The Surveilstar service controller and the SQL server service are exactly the Surveilstar "server". 3. Generate agents for computers you need to monitor. Start> All Programs> Surveilstar> Agent Installation Generator. Use it to generate agents, input your computer name/IP address in the first line. Then follow the directions in the user manual to make sure the generate-agents is correct. Copy the generated agent installation programs and paste them to your staffs' computers. Then install them and restart all computers after installations. 4. Come to your own computer and open your surveilstar V3 console (which is only in your computer, it is more like a controller for you to see what the staffs are doing) . Please note- for your first log in, just use name "admin" and set the default password blank. Meanwhile, you have to close your staffs' anti-virus software or something like that too. If you have any questions, please do not hesitate ask from Surveilstar Support Team.